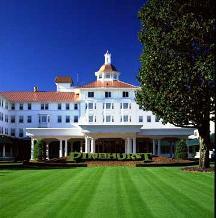 Today, with a golfing heritage that can be traced back to the late 1890ís when James Tufts first purchased the land and hired Frederick Olmstead, who had designed New York City’s Central Park, to lay out the streets of Pinehurst and then imported Ross to oversee the operation of his golf club; the region has grown into one of the pre-eminent golfing destinations in the world…an enclave where history and tradition have come together with a unique landscape to create an interesting collection of quaint southern villages with quiet, country lanes and world class resorts . Anchored by the venerable Pinehurst Resort and bolstered by the addition of almost fifty other courses, Pinehurst and the Sandhills, which includes neighboring Southern Pines and Aberdeen, offer an array of golfing venues that many consider to be the best in the world. For many, it is not golf that has attracted them to the Sandhills, but rather the area’s reputation as an equestrian center. Many large horse farms are located in Southern Pines, where several outlying roads have been left unpaved to accommodate riders. Several equestrian events are annual affairs, and the Pinehurst Harness Track serves as a major training facility for a number of harness horses each year. An increasing influx of new residents has been moving into the area for several years, but the pace of growth is no where near as fast and furious as some Carolina coastal areas, such as Myrtle Beach and Hilton Head. In fact, the slower, laid-back lifestyle enjoyed by the residents of Pinehurst and surrounding environs is in stark contrast to that prevalent in many other popular golfing destinations. Here, it can truly be said, is a place where the experience of golf can still be enjoyed and savored the way it was meant to be…at a relaxed and tranquil pace. While there are many expensive and luxurious homes lining the fairways, homesites can still be purchased in some locations at very affordable prices. 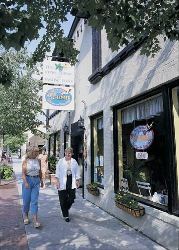 Specialty shops in both Pinehurst and Southern Pines offer a variety of unique and interesting merchandise, and any lack of variety can be remedied by the larger shops found in the nearby metropolitan areas of Raleigh and Charlotte, which are within a one and two-hour drive respectively. The quality and availability of medical care is first class, with the facilities of Moore Regional Medical Center having been constantly improved and upgraded. Located in the master-planned Mid South Club, one of the most prestigious golf communities in the Pinehurst area, Camden Villas offers a luxurious lifestyle in a neighborhood of fifty-eight ranch-style condominiums situated on the highly acclaimed Arnold Palmer signature golf course. Surrounded by four holes of golf, these spacious units feature 2 & 3 bedroom ranch-style floor plans complete with a Carolina room and attached 2-car garage. Request more information on Camden Villas.